Having participated in a Quilts of Valor presentation, I wanted to try to give more to that organization. So, when my friend Bonnie asked me to quilt one for her, I readily agreed. 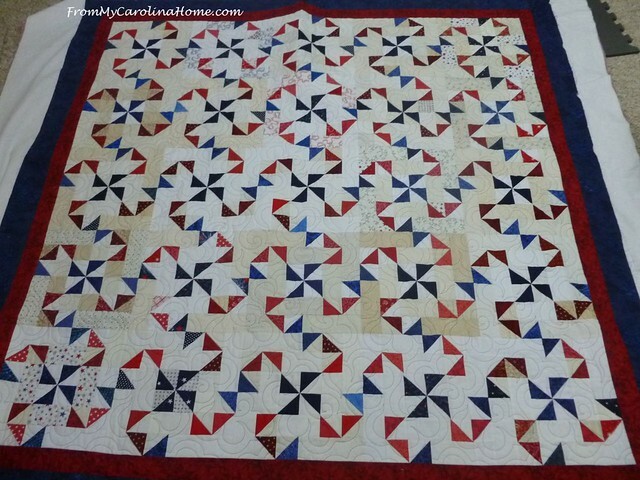 She brought this lovely pieced scrappy red, white, and blue, with a red wide backing. Wide backings are lovely, LOL!! The great part is she says, ‘just do whatever’. So, I picked red Glide thread for the top with Bottom Line in the bobbin. 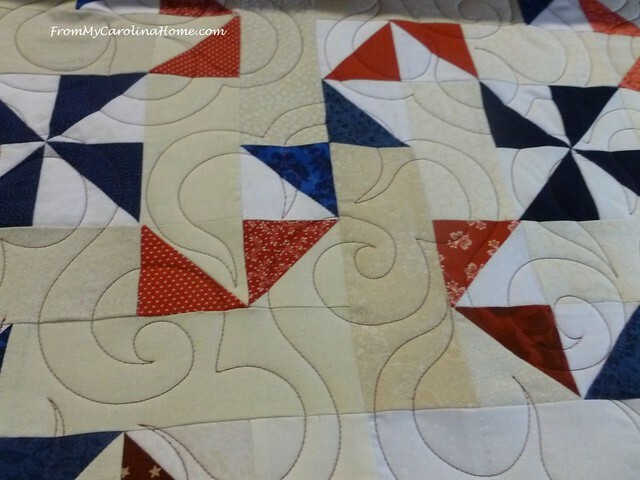 I’ve said this before, but I tend to go with darker colors for quilting to give more pattern to the white and cream background while allowing the red and blue piecing design to shine. The pantograph is Halcyon by Lorien for Willow Leaf Studios. I like the look of the red on the borders too. 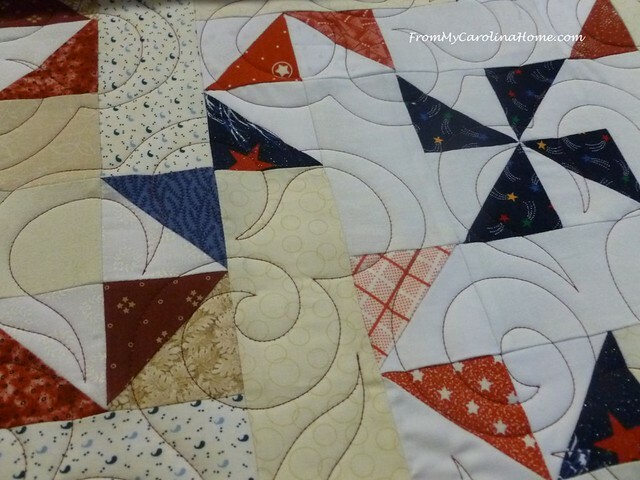 Bless Bonnie, she knows how to attach borders flat, using the Measure and Cut method. All finished quilting. Bonnie came by to pick it up, and we trimmed it before she went home. She plans to present it in June at the next presentation ceremony. 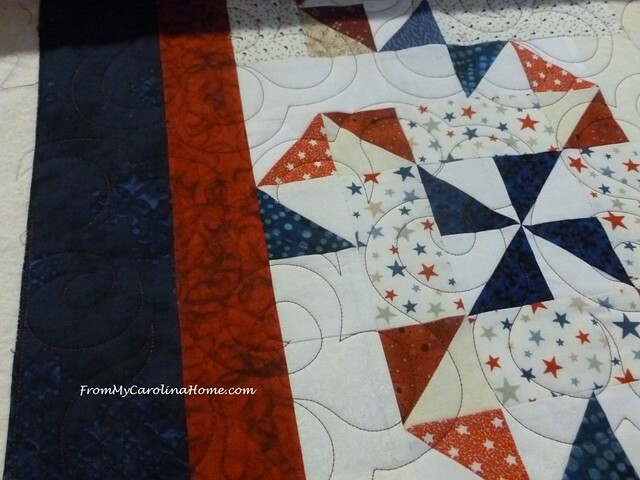 You may remember the Collaborative Quilt of Valor that I did with reader Melanie’s patriotic blocks. I wasn’t able to attend that presentation, but told Didi to just go ahead with someone else presenting. Later, Lt Col King sent this note through to everyone associated with the presentation. 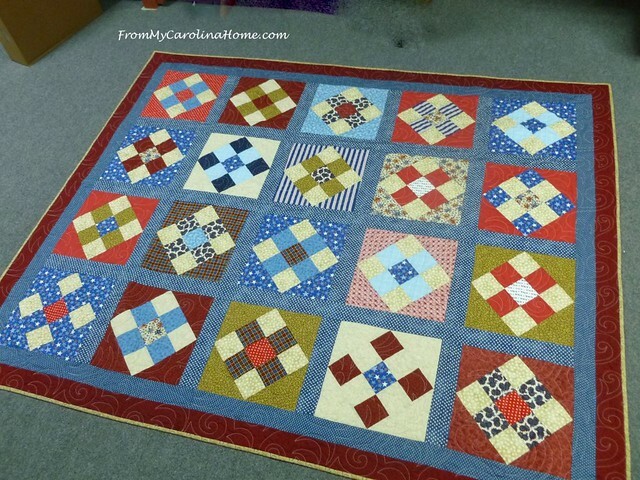 “This is just a note to thank you and all the ladies of Quilts of Valor for the beautiful quilt and the wonderful ceremony where I received my quilt. This is an item I will cherish for the rest of my life and be proud to pass on to my son who is also a Marine. I cannot decide if I want to place it around me as I sit in my recliner, hang it on a wall for everyone to see, or lock it away for safe keeping. I took the quilt to my church this morning and showed it to members with pride and a deep sense of thanks to the ladies that made all this happen for me. Please share my thanks to everyone involved in your program. With sincere appreciation I am Lt Col Hubert ‘Bert’ G. King, Jr.” He is second from the left in the picture below. I won’t be able to attend the next presentation as it hits on a day I already have a day long adventure planned. But, I will try to get working on my QOV from retreat to present later in the year. Are you working on a quilt now? Have you made a Quilt of Valor or attended a presentation? This post gave me chills….thank you to all! 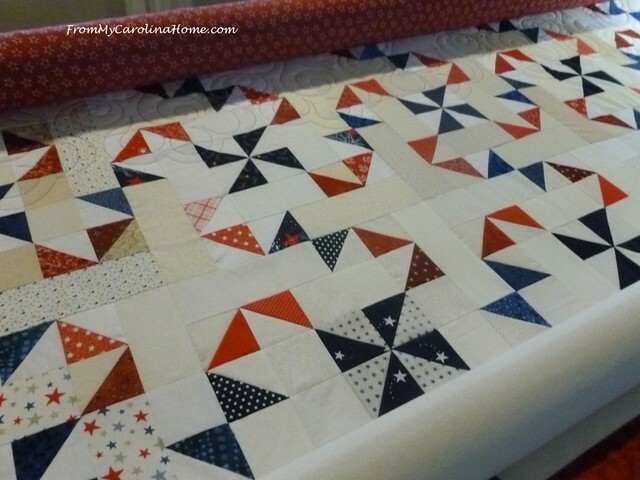 Loved reading about the letter from the Lt. Col. I’ve not made a QOV quilt as such, but have made many quilts for American Heroes which gives quilts to injured military personnel. And have one in process at this point which I’ll get back to at some point. Quilts of Valor is my passion. I love making the quilts and when presented the Veterans (and their families) are so touched. To honor our Veterans in such a small way is such a blessing! Thank you for supporting QOV. My friends and I attended the Quilt and Sewing Expo in GA last month and a QOV was presented on both Friday and Saturday evening. They did the same last year. It is always a joy and privilege to see the veterans receive their quilts. Our guild is making QOVs and will have a special showing of them at our biennial quilt festival this June before giving them to the Alabama chapter for presentation. This is a beautiful quilt you quilted! Wonderful story and so nice to hear from the receipiant who sounds like he was so touched. I have made QOV tops and sent to regional offices for finishing. We do a presentation at the Wounded Warriors special snow events @ Windham Ski Resort. All the guilds in the Catskill Mt. Quilters Hall of Fame make quilts year long for this as almost 100 quilts are given out. We made quilts for Veterans at OMK (Operation Military Kids) camp. It was fun teaching the kids to sew and mentoring them through the process, though it was always a bit of a challenge for the long armer, but she was also a mentor so she some how made it work! 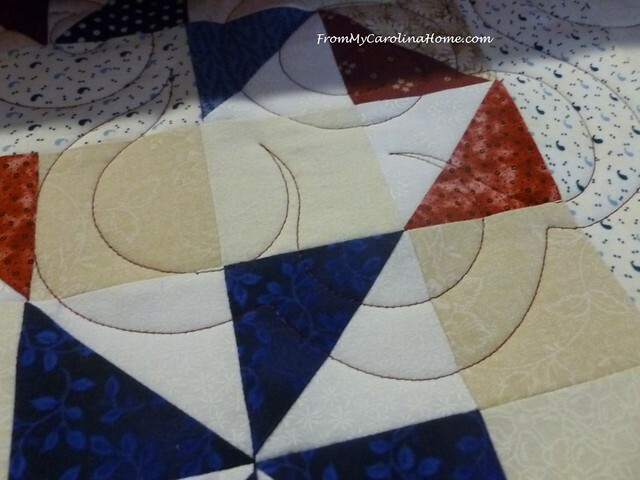 Is there a pattern for Bonnie’s quilt. It’s adorable. What an amazing story. I’m so glad that you were able to communicate with Bert and how awesome to know he appreciates the quilt so much he is taking it to his reunion! Wonderful post. Thank you for all you do. Like Mary Jo, I wonder if you would ask Bonnie to share where she got the pattern. It would make a very happy kids quilt in scrappy bright colors. Apparently she assembled blocks that another group made, she didn’t know the pattern name. His words,,, they would give any quilter tears of delight. How wonderful he has shared it so much with others, and now it will be used for comfort and warmth . Great job, Carole. Love the quilt you and Bonnie made together. Bert’s story gives gives me teary eyes and goose bumps. His letter warms my heart. 😊 I’m working on a QOV for my son now. I have made a quilt for QoV and had a representative from a local quilting group present my father with his own QoV over a year ago. When I am home, I quilt quilts for American Heros and QoV. They are both fabulous organizations! Such a touching post. 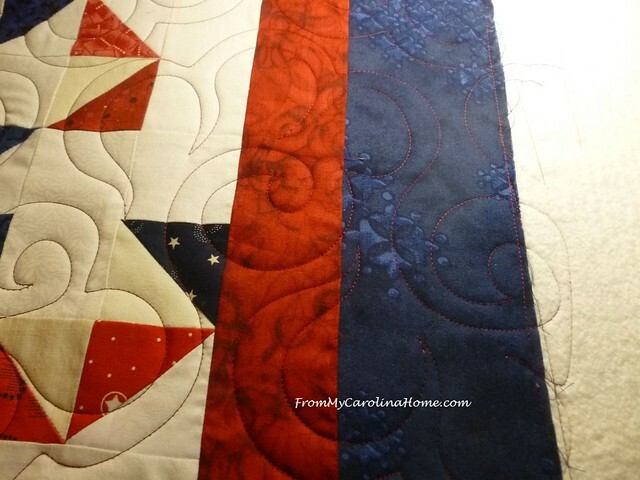 I love the quilt you quilted and love the stitching pattern. Lovely. The quilt will be cherished for years to come. What a great exchange with the Lt. Col. who received a QOV you participated in. I have a son active in the Marines and he’s very proud to be a Marine. I think he’s a lifer as he has been in for 10 years now. We’re very proud of him and what he does. Thanks for posting. That’s fabulous quilt. I love the movement in it. What a wonderful story from the colonel. This makes it all thee more special when you get letters like these. Carole, I was involved with a quilting group and we probably did 80 quilts. Now and then we would get a thank you card, it was always nice to hear from the recipients. The quilt that you quilted is lovely! Last year I personally made 66 QOV’s and awarded 591 to Veterans made by my group. So far this year I have made16, and awarded over 140. My group has made a total of 5,320 quilts so far!! What a fabulous post!! I haven’t made a QOV but have always wanted to do so. What a worthwhile endeavor. Thank you so much for urging the quilt to be used and loved. I know so many people think of a cherished quilt as an heirloom, but they don’t keep anyone warm folded up in a closet!!! Thank you for sharing this with us and always being a wonderful source of inspiration!! Wow! 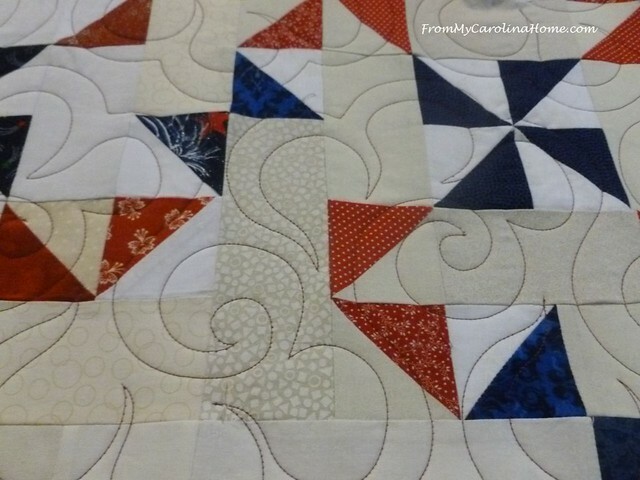 I love the pattern of the pinwheels in this new quilt, and the story from the previous presentation is beautiful! I’m so glad you wrote him a note and encouraged him to use his quilt. What a lovely story! I’ve long had making a Quilt of Valor on my quilty bucket list and I think 2019 is the year!